Steve’s 2018 rig is sold. 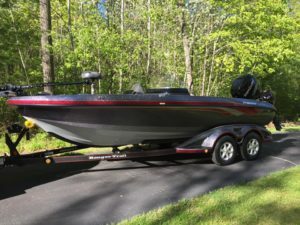 He sells his boat at the end of each season, and the buyers typically save about 25 percent compared to buying a new rig! Steve runs a fully-loaded 619FS Fisherman model which measures 19 feet 8 inches. As a member of the promotional staffs of Ranger Boats, Mercury Outboards, Humminbird and Minn Kota, Steve buys and sells a completely-new boat rig every year. His boats are garage-kept when not on the water and he is meticulous about their maintenance. At the end of the season, Steve sells the rig for what he’s paid for it. Click here to contact Steve about his boat. 1. When is Steve’s boat available? Steve is an avid hunter and sells his boats on or about November 1 each season. Depending on his schedule, you may be able to buy the boat a couple weeks earlier. By doing so, you still have time to fish from your new rig this season. 2. How many hours will be on the outboards? Typically, Steve’s main outboard will have 70-80 hours when he’s done fishing for the year. (This can be verified by the Merc Monitor gauge rigged on Steve’s boat’s console.) The kicker is used for boat control in big wind and will typically have fewer than 20 hours on it. Yes, all remaining warranties will transfer to the new buyer. Steve always participates in Mercury’s Five-And-Drive warranty program, buying an extended warranty for the main outboard. This means the main outboard will have four remaining years of full warranty. The kicker will also have four years remaining. 4. In what condition will the boat be when Steve sells it? Steve guarantees that everything will be in good, working order and that any scratches in the boat’s hull above the waterline will be fixed at his expense. Ranger carpeting is extremely high quality and does not stain. Steve does not fish tournaments so this boat will not have been stressed by excessive speeds in heavy winds. 5. What features and options are included with this boat? 6. I’ve had a different brand of electronics and my waypoints are saved in that brand’s format. Can my waypoints be converted to Humminbird’s GPS system? Yes, easily. Humminbird offers Humminbird PC on its website, and any competing brand’s waypoints can be converted. In fact, Steve’s waypoints were the first ever converted by Humminbird and they were dead-on accurate. 7. Is there anything regarding the sale of the boat that is not included in the price? You are responsible for any applicable sales taxes and any warranty transfer fees. 8. Will Steve deliver the boat? Yes, within a four-hour drive of his home. Otherwise, arrangements can be made for mileage expense or to meet Steve at a predetermined point. 9. I’m in. How do I buy this boat? A 10-percent down payment is required to hold Steve’s boat, with the balance due in the form of a cashier’s check or money order at the time of delivery.